Summer is here and with it comes a completely different range of products that you may want to rock in the sun. 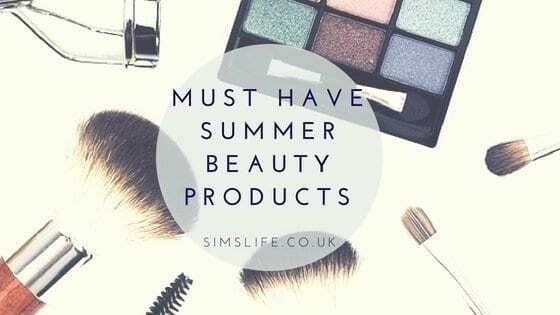 Here are a few of my favourite summer beauty items to completely rock the heatwave of 2018! The beauty subscription service sends you random beauty treats to your door each month and the June subscription box was my first try of Birchbox. For the very reasonable price of £10, the month’s special offer was to receive another box of summer beauty items too (see below image). The main products arrived in a gorgeous tin to celebrate the Birchbox 5th birthday and was I in for a treat! The box contained: a full sized Ella Eden eyeshadow (£12.99), Benefit POREfessional Pearl Primer (sample size), Number 4 Lumiere d’Hiver Super Comb Prep& Protect, Polaar Sun fluid for face and body, Birchbox Brush Cleaner (£5) and a pack of birthday celebration Whittard of Chelsea teabags. Did I find Birchbox good value? For this particular month’s special offer of two boxes, absolutely! You can cancel your subscription at any time, so if you only wanted a one box treat with no commitment, then you can. Monthly subscriptions start from £10 plus £2.95 – making them a fantastic gift idea! Birchbox extra box from June special offer. Aaliyah made such a huge impression when I was in my late teens, I lived for R&B and the music she produced totally rocked. Unfortunately she passed away far too young, but her legacy still continues to this day, not only through music, but make up also. MAC Cosmetics have recently launch a new ‘Aalyiah’ range named after her songs. I couldn’t wait to get my hands on a lipstick from this range in shade ‘More The A Woman’ (£17.50). The dark plum colour is perfect to #BeMoreWitWitWoo and I intend to rock this summer beauty shade. Having only ever used lipgloss, my foray into wearing bold lipsticks is going to be interesting! How have I never tried these fragrances before? If you shop around in stores such as B&M or TJ Hughes, you can always find a better deal that the RRP of £15. In fact, you will find the range of Victoria’s Secret currently on sale on their website here. These will be my scent of the summer and I am currently surprised how long the body mists are lasting. You only need to liberal spray or two to have a scent that will last some hours. Handy for keeping in your bag, spritz when you are out and about to ensure a fresh scent all day long.